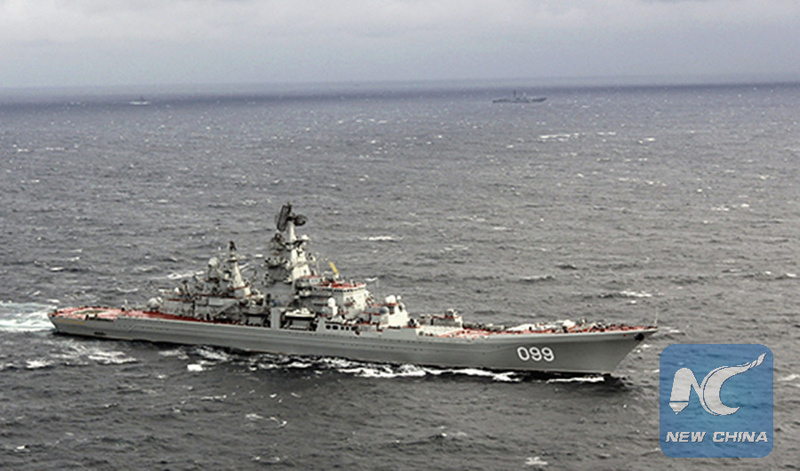 A picture of heavy nuclear missile cruiser "Peter the Great" is posted on the website of the Russian Defense Ministry. MOSCOW, Nov. 3 (Xinhua) -- Heavy nuclear missile cruiser "Peter the Great" of Russia's Northern Fleet entered the Barents Sea on Saturday to "perform combat training missions," the Russian Defense Ministry said in a press release. The cruiser crew will conduct a series of exercises on anti-submarine and air defense and perform combat training exercises with the use of practical weapons, it said. Two Russian Tu-142 anti-submarine planes on Friday patrolled the neutral waters of the Norwegian Sea for more than 12 hours, and the flights strictly abided by international law, the Defense Ministry said in another statement Saturday. Earlier this week, two Russian Tu-160 strategic bombers patrolled the neutral waters of the Barents and Norwegian Seas for 10 hours. Russia flexed its muscle as the North Atlantic Treaty Organization (NATO) is holding the "Trident Juncture 2018" drills in Norway and its surrounding seas from Oct. 25 to Nov. 7, the largest since the end of the Cold War. The drills involve around 50,000 troops from the 29 NATO members and its partners Sweden and Finland, as well as about 250 aircraft, 65 vessels and up to 10,000 vehicles.